The original press release below has generated quite a reaction, some positive some negative. To be clear: we are not opposed to music festivals in central Bristol. We believe that a better solution needs to be found to managing this one. And we need more space, and more suitable space for events in central Bristol. 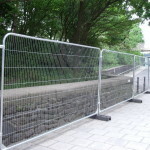 Overnight, a park with footpaths and cycle routes is sealed off. People arrive next morning to find their routes blocked by 7 foot high steel fences patrolled by security guards. Is this the Crimea? The West Bank? No – Castle Park in Bristol. 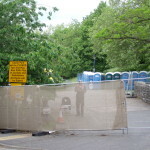 In preparation for a weekend music festival (Love Saves the Day – tickets £39.50 to £59.50) Castle Park has been sealed off for a whole week. The heavily used footpath and cycle route from Bristol Bridge to Old Market has been closed with diversions onto busy roads including Newgate, Wine Street and Victoria Street. The Living Heart for Bristol, whose members include walking and cycling groups has criticised the closure and called for the policy to be reviewed for next year. “The organisers of other events like the Harbour Festival and Pride manage to stage music festivals without closing vital routes for pedestrians and cyclists. Parks should be for everyone. To close a park for a week for something lasting two days is ridiculous. For anyone trying to walk from Temple Meads to Broadmead, for example, this puts in a really big detour. If the organisers of this event need this sort of military-style security, the Council should not allow them to sever vital routes for pedestrians and cyclists. A better arrangement or a different location must be found for next year. Posted on 23 May 2014 at 4:24 pm. Thank you for this. I objected in 2103 to the premises/event licence for Love Saves the Day, due to the damaged caused to the park in 2012 (photos https://www.flickr.com/photos/lintycam/sets/72157632779213400/) and on the grounds that a public park should not be closed to the public. Spoke with Bristol City council and organiser at licence hearing however they said since my concerns had been listened to and as they were being addressed they would grant the licence. Tried to get a petition going on the council’s website however it received very few signatures http://epetitions.bristol.gov.uk/epetition_core/community/petition/2290. By closing the park every year in this way, the park can never be register as a Town Green or Public Right of Way. So glad you are taking on the issue of Castle Park. Public parks for the public. Thank you for this. I objected in 2013 to the premises/event licence for Love Saves the Day, due to the damaged caused to the park in 2012 (photos https://www.flickr.com/photos/lintycam/sets/72157632779213400/) and on the grounds that a public park should not be closed to the public. Spoke with Bristol City council and organiser at licence hearing however they said since my concerns had been listened to and as they were being addressed they would grant the licence. The Victorians decimated historic Bristol to build Victoria Street which is a direct route from Bristol Bridge to Temple Meads. There is no “really big detour” here with the closure, as Castle Park is not on the route. This was commenting from the point of view of someone approaching via the riverside – which is actually more direct than Victoria Street. The detour around the park was not given any thought,seemingly, for the diverted foot traffic.The road around the Bank of England was choked with vehicles being left parked over the pavements. Leaving a slippery pebbled strip down to Bristol Bridge. Give the kids skate ramp area next to Greville Smythe Park?